Swifturn Free Video Joiner enables you to join, merge or combine movies, Music Videos, YouTube videos, even HD videos into a big video file; or combine these separate parts together for a non-stop playback or DVD authoring. 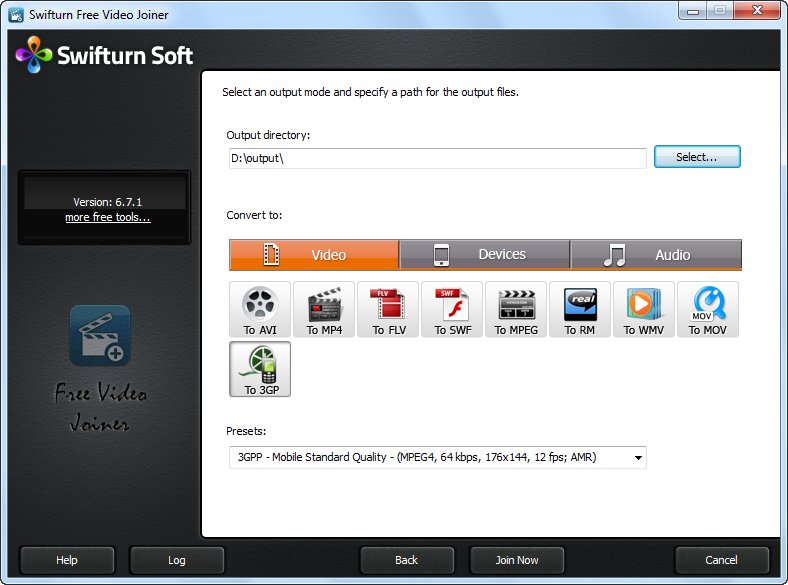 You can input files of literally ANY video format you know into Swifturn Free Video Joiner: AVI, WMV, MP4, ASF, DVR-MS, MS-DVR, MOV, 3GP, 3G2, FLV, SWF, QT, RM, RMVB, MKV, AVS, M2TS, MPG, VOB, DV, M1V, M2V, DAT, AMV and more. Video joining tool which has the ability to join multiple videos into one. ...... these separate parts together for a non-stop playback or DVD authoring. You can input files of literally ANY video format you know into Swifturn Free Video Joiner: AVI, WMV, MP4, ASF, DVR-MS, MS-DVR, MOV, 3GP, 3G2, FLV, SWF, QT, RM, RMVB, MKV, AVS, M2TS, MPG, VOB, DV, M1V, M2V, DAT, AMV, DIVX, M4V, MPE, MPV, OGM and hundreds more. The wide range of supported formats makes it a number one choice for your video joining needs. The world's best video software for video joining and merging. help you join multiple video files into one large movie file. Join several types of video files in one large file in AVI/MPEG/WMV/ASF format. It joins all kinds of video files into a large avi file with transition effects. Easist video joiner merges AVI/MPEG/MP4/MPG/WMV/MOV... videos to a large one. Qweas is providing links to Swifturn Free Video Joiner 6.7.4 as a courtesy, and makes no representations regarding Swifturn Free Video Joiner or any other applications or any information related thereto. Any questions, complaints or claims regarding this application Swifturn Free Video Joiner 6.7.4 must be directed to the appropriate software vendor. You may click the publisher link of Swifturn Free Video Joiner on the top of this page to get more details about the vendor.